Commercial health apps: in the user’s interest? We investigated the nature of data transmission to third parties among top rated medicines related apps, including the type of consumer data and the number and identities of third parties, and we characterised the relations among third parties to whom consumer data are transmitted. We carried out this study in two phases: the first was a traffic analysis of the data sharing practices of the apps and the second was a content and network analysis to characterise third parties and their interrelations (box 1). We purposefully sampled medicines related apps that were considered prominent owing to being highly downloaded, rated in the top 100, or endorsed by credible organisations. During 17 October to 17 November 2017, we triangulated two sampling strategies to identify apps. In the first strategy we used a crawling program that interacted directly with the app store’s application programming interface. This program systematically sampled the metadata for the top 100 ranked free and paid apps from the Medical store category of the United Kingdom, United States, Australian, and Canadian Google Play stores on a weekly basis. In the second strategy we screened for recommended or endorsed apps on the website of an Australian medicines related not-for-profit organisation, a curated health app library, a published systematic review, and personal networks of practising pharmacists. ● Has some degree of interactivity with the user, defined as requiring user input. We excluded apps if they were available exclusively to customers of a single company (pharmacy, insurance plan, or electronic health record), were targeted at or restricted to use in a single country (ie, a formulary app for UK health professionals employed by the National Health Service), were prohibitively expensive (>$100; >£76; >€88), or were no longer available during the analysis period. The methods of the traffic analysis are described in detail elsewhere.16 For this analysis we made use of Agrigento, a tool for detecting obfuscated privacy leaks such as encoding or encryption in Android apps. In a laboratory setting, between November and December 2017, we downloaded each app onto a Google Pixel 1 smartphone running Android 7.1. We purchased subscriptions when required (in the form of in-app purchases). Between December 2017 and January 2018 we simulated real world, in-depth use of the app using four dummy scripted user profiles (one doctor, one pharmacist, and two consumers; see supplementary file), including logging in and interacting with the app while it was running, which involved manually clicking on all buttons, adjusting all settings, and inputting information from the dummy profile when applicable. As all apps were available to the public, we randomised the dummy user profiles irrespective of the app’s target user group. Using one randomly assigned dummy scripted user profile for each app, we ran the app 14 times to observe its “normal” network traffic related to 28 different prespecified types of user data, such as Android ID, birthday, email, precise location, or time zone. Fourteen executions of the app were required to establish a baseline and to minimise the occurrence of false positives.16 Then we modified one aspect of the user’s profile (eg, location) and ran the app a 15th time to evaluate any change in the network traffic. This differential analysis allowed the detection of an incidence of user data sharing by observing any deviations in network traffic. Change in traffic during the 15th run indicated that the modified aspect of the user’s profile was communicated by the app to the external network, meaning that user data were shared with a third party. We repeated the 15th run for each of the 28 prespecified types of user information, altering one type of data for each run. The results of the traffic analysis included a list of domain names and respective IP addresses receiving user data and the specific types of user data they received. We identified the recipients of user data by integrating Agrigento with Shodan, a search engine for servers, to obtain geographical information for IP addresses. To reveal the identity of the entities involved, we used the public WHOIS service, a database of domain registrations. Leveraging these tools, we were able to obtain information about the hosts that receive data from the apps, such as location and owner of the remote server. For each of the entities receiving user data in the traffic analysis, two investigators independently examined their Crunchbase profile, company website, and linked documents such as privacy policies, terms and conditions, or investor prospectus. The investigators extracted data related to the company’s mission, main activities, data sharing partnerships, and privacy practices related to user data into an open ended form in RedCap.17 Data were extracted between 1 February 2018 and 15 July 2018; one investigator extracted data before, and the other after, the General Data Protection Rules (GDPR) were implemented in the European Union in May 2018, which meant that some developers disclosed additional data sharing partnerships in their privacy policies.18 Any discrepancies were resolved through consensus or consolidation and by taking the more recent information as accurate. We classified entities receiving user data into three categories: first parties, when the app transmitted user data to the developer or parent company (users are considered second parties); third parties, when the app directly transmitted user data to external entities; and fourth parties, companies with which third parties reported the ability to further share user data. We calculated descriptive statistics in Excel 2016 (Microsoft) for all app and company characteristics. Using NVivo 11 (QSR International), we coded unstructured data inductively, and iteratively categorised each company based on its main activities and self reported business models. The second network represents the potential sharing of user data within the mobile ecosystem, including to fourth parties. To simplify the representation, we grouped apps, their developers, and parent companies into “families” based on shared ownership, and we removed ties to third parties that only provided infrastructure services as they did not report further data sharing partnerships with fourth parties. We report third and fourth parties’ direct and indirect access to app users’ data and summarise the scope of data potentially available to third and fourth parties through direct and indirect channels. This simulation assumes that the same person uses all apps in our sample and it shows how her or his data get distributed and multiplied across the network, identifying the most active distributors of data and the companies that occupy favourable positions in the network, enabling each to gather and aggregate user data from multiple sources. We undertook this research from the perspective of an Australian app user and in partnership with the Australian Communications Consumer Action Network (ACCAN), the peak body for consumer representation in the telecommunications sector. In continuation of an existing partnership,21 we jointly applied for funding from the Sydney Policy Lab, a competition designed to support and deepen policy partnerships. A representative from ACCAN was involved in preparing the funding application; designing the study protocol, including identifying outcomes of interest; team meetings related to data collection and analysis; preparing dissemination materials targeted at consumers; and designing a dissemination strategy to consumers and regulators. Overall, 24 apps were included in the study (table 1). Although most (20/24, 83%) appeared free to download, 30% (6/20) of the “free” apps” offered in-app purchases and 30% (6/20) contained advertising as identified in the Google Play store. Of the for-profit companies (n=19), 13 had a Crunchbase profile (68%). As per developer self report in the Google Play store, apps requested on average 4 (range 0-10) “dangerous” permissions—that is, data or resources that involve the user’s private information or stored data or can affect the operation of other apps.15 Most commonly, apps requested permission to read or write to the device’s storage (19/24, 79%), view wi-fi connections (11/24, 46%), read the list of accounts on the device (7/24, 29%), read phone status and identity, including the phone number of the device, current cellular network information, and when the user is engaged in a call (7/24, 29%), and access approximate (6/24, 25%) or precise location (6/24, 25%). In our traffic analysis, most apps transmitted user data outside of the app (17/24, 71%). Of the 28 different types of prespecified user data, apps most commonly shared a user’s device name, operating system version, browsing behaviour, and email address (table 2). Out of 104 detected transmissions, aggregated by type of user data for each app, 98 (94%) were encrypted and six (6%) occurred in clear text. Out of 24 sampled apps, three (13%) leaked at least one type of user data in clear text, whereas the remainder 14 (58%) only transmitted encrypted user data (over HTTPS) or did not transmit user data in the traffic analysis (7/24, 29%). After implementation of the GDPR, developers disclosed additional data sharing relations within privacy policies, including for two additional apps that had not transmitted any user data during the traffic analysis. Thus, a total of 19/24 (79%) sampled apps shared user data (see supplementary table 2). Table 3 displays the data sharing practices of the apps (see supplementary table 2 for overview of data sharing practices) detected in the traffic analysis and screening of privacy policies. We categorised first and third parties receiving user data as infrastructure providers or analysis providers. Infrastructure related entities provided services such as cloud computing, networks, servers, internet, and data storage. Analysis entities provided services related to the collection, collation, analysis, and commercialisation of user data in some capacity. Developers engaged a range of third parties who directly received user data and provided services, ranging from error reporting to in-app advertising to processing customer service tickets. Most of these services were provided on a “freemium” basis, meaning that basic services are free to developers, but that higher levels of use or additional features are charged. We categorised 18 entities (18/55, 33%) as infrastructure providers, which included cloud services (Amazon Web Services, Microsoft Azure), content delivery networks (Amazon CloudFront, CloudFlare), managed cloud providers (Bulletproof, Rackspace, Tier 3), database platforms (MongoDB Cloud Services), and data storage centres (Google). Developers relied on the services of infrastructure related third parties to securely store or process user data, thus the risks to privacy are lower. However, sharing with infrastructure related third parties represents additional attack surfaces in terms of cybersecurity. Several companies providing cloud services also offered a full suite of services to developers that included data analytics or app optimisation, which would involve accessing, aggregating, and analysing app user data. The privacy policies of these entities, however, stated this would occur within the context of a relationship with the developer-as-client and thus likely does not involve commercialising app user data for third party purposes. We categorised 37 entities (37/55, 67%) as analysis providers, which involved the collection, collation, analysis, and commercialisation of user data in some capacity. Table 4 characterises these analysis providers based on their main business activities. While certain data sources are clearly sensitive, personal, or identifying (eg, date of birth, drug list), others may seem irrelevant from a privacy perspective (eg, device name, Android ID). When combined, however, such information can be used to uniquely identify a user, even if not by name. Thus, we conducted a network analysis to understand how user data might be aggregated. We grouped the 55 entities identified in the traffic analysis into 46 “families” based on shared ownership, presuming that data as an asset was shared among acquiring, subsidiary, and affiliated companies as was explicitly stated in most privacy policies.23 For example, the family “Alphabet,” named for the parent company, is comprised of Google.com, Google Analytics, Crashlytics, and AdMob by Google. Supplementary figure 1 displays the results of the network analysis containing apps, and families of first and third parties that receive user data and are owned by the same parent company. The size of the entity indicates the volume of user data it sends or receives. We differentiated among apps (orange), companies whose main purpose in receiving data was for analysis, including tracking, advertising, or other analytics (grey), and companies whose main purpose in receiving data was infrastructure related, including data storage, content delivery networks, and cloud services (blue). From the sampled apps, first and third parties received a median of 3 (interquartile range 1-6, range 1-24) unique transmissions of user data, defined as sharing of a unique type of data (eg, Android ID, birthdate, location) with a first or third party. Amazon.com and Alphabet (the parent company of Google) received the highest volume of user data (both received n=24), followed by Microsoft (n=14). First and third parties received a median of 3 (interquartile range 1-5; range 1-18) different types of user data from the sampled apps. Amazon.com and Microsoft, two cloud service providers, received the greatest variety of user data (18 and 14 types, respectively), followed by the app developers Talking Medicines (n=10), Ada Health (n=9), and MedAdvisor International (n=8). Supplementary figure 2 displays the results of a network analysis conducted to understand the hypothetical data sharing that might occur within the mobile ecosystem at the discretion of app developers, owners, or third parties. Analysis of the websites and privacy policies of third parties revealed additional possibilities for sharing app users’ data, described as “integrations” or monetisation practices related to data (eg, Facebook disclosed sharing end user data with data brokers for targeted advertising). Integrations allowed developers to access and export data through linked accounts (eg, linking a third party analytics and advertising service); however, privacy policies typically stipulated that once data were sent to the integration partner, the data were subject to the partner’s terms and conditions. Supplementary figure 2 displays the network including fourth parties. All the companies in the fourth party network receive user data for the purposes of analysis, including user behaviour analytics, error tracking, and advertising. We classified entities in the fourth party network by sector, based on their keywords in Crunchbase, to understand how health related app data might travel and to what end. The fourth party network included 237 entities including 17 app families (apps, developers, and their parent companies in orange) (17/237, 7%), 18 third parties (18/237, 8%), and 216 fourth parties (216/237, 91%); 14 third parties were also identified as fourth parties (14/237, 6%) meaning that these third parties identified in the traffic analysis could also receive data from other third parties identified in the traffic analysis. Supplementary figure 2 shows that most third and fourth parties in the network (blue) could be broadly characterised as software and technology companies (120/220, 55%), whereas 33% (72/220) were explicitly digital advertising companies (grey), 8% (17/220) were owned by private equity and venture capital firms (yellow), 7 (3%) were major telecommunications corporations (dark grey), and 1 (1%) was a consumer credit reporting agency (purple). Only three entities could be characterised predominantly as belonging to the health sector (1%) (brown). Entities in the fourth party network potentially had access to a median of 3 (interquartile range 1-11, range 1-140) unique transmissions of user data from the sampled apps. 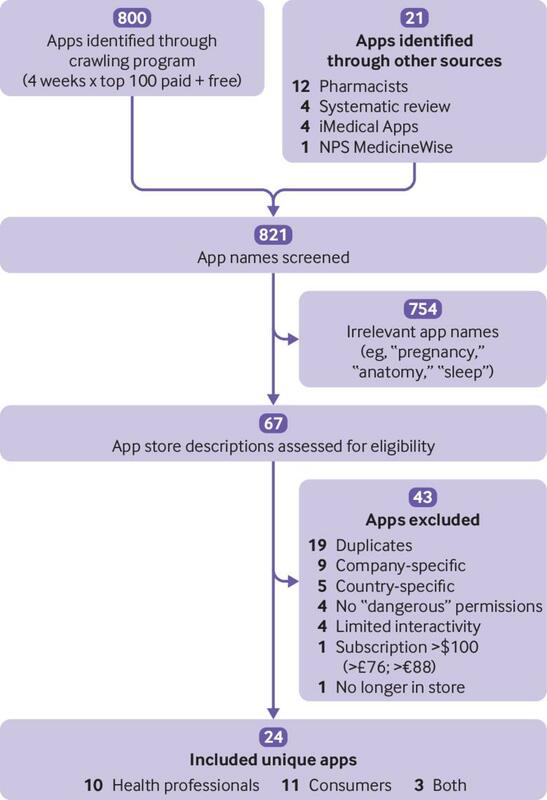 Our analysis of the data sharing practices of top rated medicines related apps suggests that sharing of user data is routine, yet far from transparent. Many types of user data are unique and identifying, or potentially identifiable when aggregated. A few apps shared sensitive data such as a user’s drug list and location that could potentially be transmitted among a mobile ecosystem of companies seeking to commercialise these data. This traffic analysis was conducted at a single time point, performed on a small sample of popular apps, and is limited in terms of scalability. Thus the apps analysed might no longer be available, could have been updated, or might have changed their data sharing practices. We purposefully sampled apps to include widely downloaded ones that were likely to collect and share user data (ie, requested “dangerous” permissions and had some degree of user interactivity). It is not, however, known how the data sharing practices of these apps compare with those of mobile health apps in general. A strength of this approach was in-depth use of the app using simulated user input, including logging in and interacting with the app while it was running. The use of the Agrigento tool allowed detection of privacy leaks that were obfuscated by encoding or encryption, for example.16 This sample is not representative of medicines related apps as a population; however, this approach benefited from focusing on the medicines related apps likely to be used by clinicians and consumers. Because all apps were available to the public and many had multiple functionalities and target users, we could not clearly classify apps as targeted at consumers or health professionals and randomised the simulated user profiles irrespective of target user group. Thus, it is not known whether or how patterns in user data collection and sharing differ among target user groups, which is an important question for future research. Our analysis was restricted to Android apps, thus it is not known whether the iOS versions of these apps or medicines related apps developed exclusively for iPhone differ in data sharing practices. Future work might explore the role of Alphabet (the parent company of Google) within a data sharing network of iOS apps to see whether its dominance is associated with the type of operating system. Our characterisation of the main activities and data sharing relations of entities is based on developers’ self reported practices at the time of analysis and represents our interpretation of these materials. Data were, however, extracted in duplicate and discussed to ensure interpretation was robust. We thank Chris Klochek for developing the app store crawling program and Tanya Karliychuk, grants officer at the Australian Communications Consumer Action Network, for advising on the study design, analysis, and dissemination strategy. Contributors: QG acquired funding, designed the study, supervised and participated in data collection and content analysis, and wrote the first draft of the manuscript. KC participated in data collection and content analysis and critically revised manuscript drafts. FH participated in designing the study, conducted the network analysis, and critically revised manuscript drafts. AC conducted the traffic analysis and critically revised manuscript drafts. LB participated in designing the study and commented on the draft. RH designed the study, supervised the traffic analysis, and critically revised manuscript drafts. QG attests that all listed authors meet authorship criteria and that no others meeting the criteria have been omitted. QG and RH act as guarantors. Funding: This work was funded by a grant from the Sydney Policy Lab at The University of Sydney. QG was supported by a postdoctoral fellowship from the Canadian Institutes of Health Research. The Sydney Policy Lab had no role in the study design; in the collection, analysis, and interpretation of data; in the writing of the report; or in the decision to submit the article for publication. Data sharing: The full analysis is publicly available at: https://healthprivacy.info/. Transparency: The lead author (QG) affirms that this manuscript is an honest, accurate, and transparent account of the study being reported; that no important aspects of the study have been omitted; and that any discrepancies from the study as planned have been explained.
. Medical appointment booking app HealthEngine sharing clients’ personal information with lawyers.ABC News. 2018 June 25.
research2guidance. mHealth developer economics: How mHealth publishers are monetizing their apps. Berlin, Germany: research2guidance; 2018. Vallina-Rodriguez N, Sundaresan S, Razaghpanah A, et al. Tracking the trackers: Towards understanding the mobile advertising and tracking ecosystem. 1st Data and Algorithm Transparency Workshop; New York, NY, 2016. Binns R, Lyngs U, Van Kleek M, Zhao J, Libert T, Shadbolt N. Third party tracking in the mobile ecosystem. Proceedings of the 10th ACM Conference on Web Science. 2018. p.23-31.
. Security and privacy analysis of mobile health applications: The alarming state of practice. IEEE Access2018;6:9390-403doi:10.1109/ACCESS.2018.2799522.
. Healthcare and big data: Digital specters and phantom objects.Palgrave Macmillan US, 2016doi:10.1057/978-1-137-50221-6.
. The black box society: The secret algorithms that control money and information.Harvard University Press, 2015doi:10.4159/harvard.9780674736061. Wilson D. Drug ap comes free, ads included. The New York Times. 2011 July 29. Android Developers. System permissions. Mountain View, CA: Google, Inc; May 7, 2018, https://developer.android.com/guide/topics/security/permissions.html#normal-dangerous. Continella A, Fratantonio Y, Lindorfer M, et al. Obfuscation-resilient privacy leak detection for mobile apps through differential analysis. Proceedings 2017 Network and Distributed System Security Symposium. European Union. General Data Protection Regulation.Offical Journal of the European Union, 2018.
. R: A language and environment for statistical computing.R Foundation for Statistical Computing, 2016. Pedersen T. tidygraph: A tidy API for graph manipulation. R package version 1.1.1 2018. Grundy Q, Parker L, Raven M, et al. Finding peace of mind: Navigating the marketplace of mental health apps. Sydney, Australia; 2017. Yahoo. Developer Network. Flurry analytics terms of service Sunnyvale, CA: Oath Media; May 7, 2018. https://developer.yahoo.com/flurry/legal-privacy/terms-service/flurry-analytics-terms-service.html. Razaghpanah A, Nithyanand R, Vallina-Rodriguez N, et al. Apps, trackers, privacy, and regulators: A global study of the mobile tracking ecosystem. Proceedings 2018 Network and Distributed System Security Symposium. Google Inc. Who are Google’s partners? Mountain View, CA: Google, Inc.; 2018 https://policies.google.com/privacy/google-partners?hl=en.